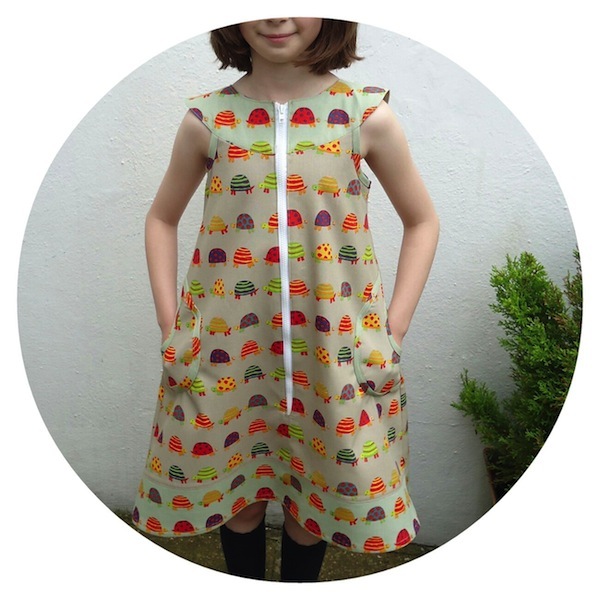 The cute curved pockets on Make It Perfect's Zip-It dress made it impossible to resist – two clicks and I'd purchased and downloaded a copy. I reasoned there was a very good chance my daughter would actually want to wear this dress as her front-zipped gingham summer dresses are currently her preferred items of school uniform. 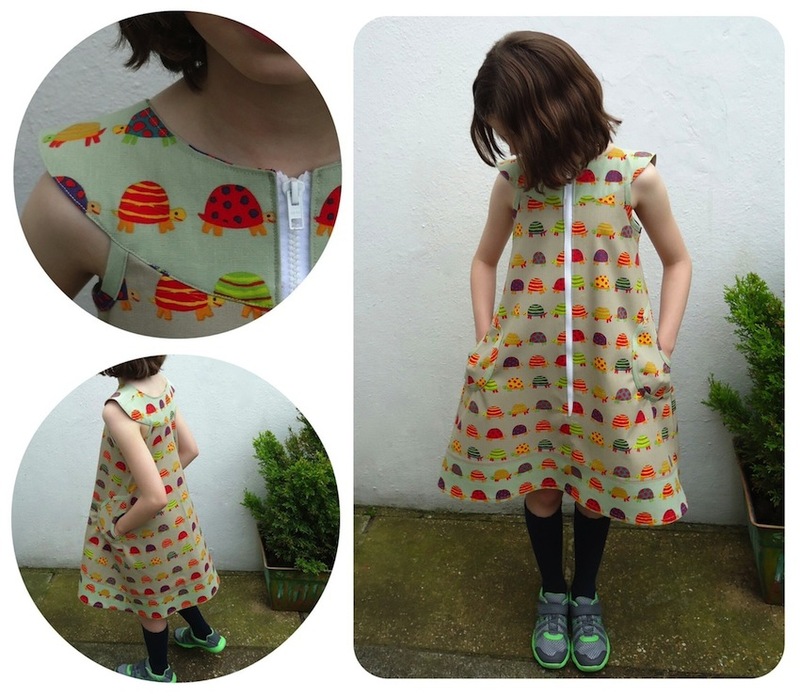 As it's a child-sized sewing pattern, printing and assembling the download was a breeze. The fabric is a recent bargain acquisition from Brighton's Fabric Land. 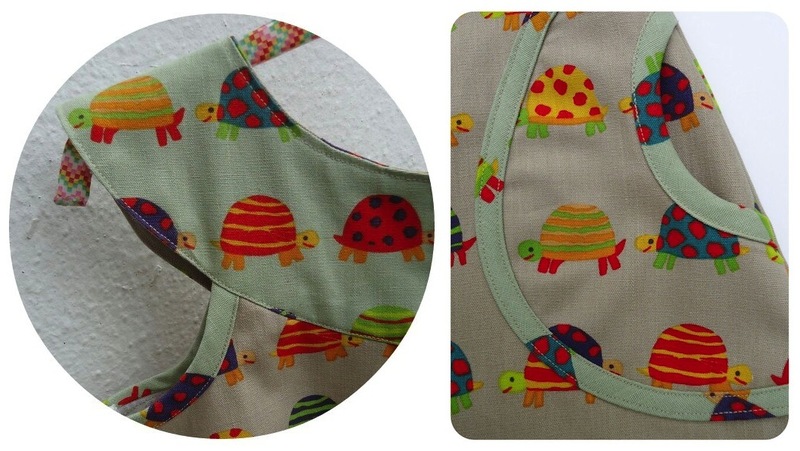 It's one of their own Hill-Berg brand designs and is a medium weight linen-feel sturdy cotton printed with bright multicoloured tortoises. It's available in three colourways and I'd bought a length in beige and a small amount of sage green without a sewing pattern in mind, so was relieved to have just enough to make this dress (though I had to add a sage green border to get the required length). It's a simple dress to make but I thought the written sewing instructions were a tad convoluted and seemed to be missing an instruction to turn the yoke back through to the right side when attaching it to the dress body. Perhaps more picture diagrams would have been helpful. No matter, I discarded the instructions and made up the dress as I thought best and am really happy with the end result. It's a gorgeous, retro-inspired design. My daughter loves it too and for the past two days has changed out of her school uniform immediately after arriving home so that she can wear it!